I recently met with Mr Paolo Cravedi, Managing Director for Alessi Americas in their San Francisco flagship store to view the 2015 Spring/Summer Collection. As you may know, I am personally a big fan of Alessi and their work, so I am always excited to see what’s new. The Australian designer followed up his initial centerpiece design with three additions to make a line of baskets. The design, coupled with the laser cutting and then the final molding process almost make it feel like a piece of origami come to life. Check out the “making of” video below. At first glance, this looks like a beautiful jewelry piece — and it is. But it’s really a bottle opener. I don’t think any of us have ever owned a bottle opener as exquisite in shapes and lines as this. This is one of my favorites. The “embroidered” patterns on this piece perfectly cut out by laser technology makes for a perfect centerpiece in the kitchen or on the dining table. In addition to Alessi’s signature clean look in stainless steel, I look forward to additional colors down the road. This could be the beginning to a beautiful line of new products. Woodwork and traditionalism are not things that Alessi is generally known for; however, with the combination of design and laser cutting technology, Alessi brings it all to the next level. 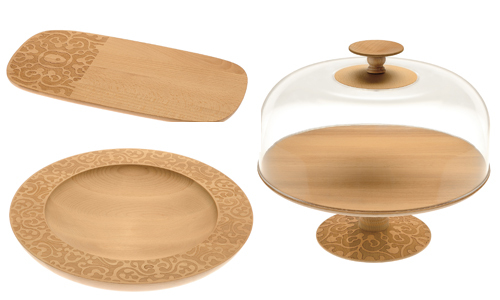 This series of kitchenware includes trays, cake stands, cheese boards and a centerpiece. See how the centerpiece is made in the video below.